Review: American Hustle / It's Just Movies Review: "American Hustle"
“The Fighter” mega-stars Christian Bale and Amy Adams reunite with director David O. Russell in a pot-boiling romp through political and law enforcement corruption in the morally adrift 1980s. Bale plays con man Irving Rosenfeld who, after founding a string of dry cleaning shops as cover for loan-sharking and art forgery, decides there must be an easier way to make a living. He finds his muse in Sydney Prosser (Adams) who does a great impersonation of a British femme fatale financier with vast wealth and international connections. Bradley Cooper, Jennifer Lawrence and Robert De Niro reunite after their huge performances in “Silver Linings Playbook” (Lawrence took home an Oscar). Although Amy Adams and Christian Bale are securely in first position as the leads of this film, it is Lawrence who pulls out all the stops. Loosely based on the ABSCAM scandal, director/writer Russell and co-writer Eric Singer assume free hands where required to juice up the script. Rosenfeld has advanced his low-level cons to the next stage, taking $5,000 retainers (not chicken feed in 1980) from desperate businessmen in return for promises of loans that Rosenfeld has no intention of providing. Prosser, in the person of Edith, the sophisticated and semi-bare-chested female financier, adds gravitas to the offers. In the middle of an otherwise routine scam, the two are busted by ethically vacuous FBI agent Richie DiMaso (Cooper). To stay out of jail, the grifters are forced to work for DiMaso, through his semi-conscious boss Stoddard Thorsen (Louis C.K.). Thorsen’s boss, an assistant federal DA who has even fewer scruples and a lower common sense IQ than DiMaso, is instrumental to the pratfall fest. In a hilariously escalating series of absurd exchanges with Thorsen, big city Di Maso forces the Minnesota native to fund ever more outrageous schemes to use the grifters to entrap top politicos. This upward death spiral of bureaucratic ambition is laced with Thorsen’s ongoing parable of an ill-advised ice-fishing trip with his reckless brother and his wise father whose sound advice is ignored. Not a bad set-up. So why does “American Hustle” not work as well as, say, “Fargo,” or even as well as the much less lavish “Casino Jack?” Although this is one thoroughly entertaining film (even at its length of 138 minutes), it lacks both the acting and screenwriting horsepower of either of those con classics. The film cannot decide if it wants to be a parody of 1980s fashion and New Jersey / New York personalities, or if it wants to tell a sadly tragic yet unbearably funny story about crooks who simply cannot get it right. Jeremy Renner (“Hurt Locker”) plays Carmine Polito, a composite of every NJ/NY political operator appearing in books and films in the last forty years. Although Renner’s performance is one of the best two in the film (the other is Jennifer Lawrence as Irving’s wife Rosalyn) the entertainment value of both comes down to parodies of personalities. “Fargo,” “Casino Jack” and Russell’s previous triumph, “The Fighter,” are more powerful stories because the characters are more realistic and identifiable. They are caught up, as we all could be, in a web of lies and guilt-ridden bad decisions. Polito and Rosenfeld become fast friends by virtue of their shared Bronx heritage. Rosenfeld’s narrative tells us that Polito came to America with his Italian immigrant father who shoveled coal for a living. Rosenfeld explains their actions as the desperate measures required to escape the ghetto. As self-deception this works, but most audiences will not buy it. The average person does not come out of the ghetto with the will and ability to lie and cheat desperate people on a daily basis. The word on the streets is that Jennifer Lawrence’s part, that of loyalty-disabled Rosenfeld’s sidelined wife and the mother of his much beloved son, was written specifically for her. That may well be the case, because the character, and Lawrence’s performance, goes freely, unabashedly over the top in this movie. For a brief while the film transforms into the surreal. Whether that is good or bad depends on the viewer. But there is a loss in the ability of the viewer to identify with her, and to a degree the rest of the cast, as that memorable scenes transpires. 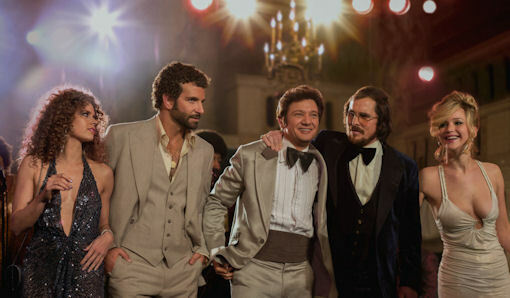 All in all, “American Hustle” features a half-dozen great performances from a half-dozen great actors, coupled with first rate sets and costumes. The film features one of the best uncredited performances in decades, by Robert De Niro playing man-you-do-not-mess-with mob kingpin Victor Tellegio. The timing is right as this story takes place just before the assumption of the mob crown by the Central American cocaine syndicates. In the 70’s and early 80’s, the mob was largely the mafia. If you are able to laugh at, and love, the mockery that popular music made of the medium in the 80’s, this first rate sound track will have you laughing and crying at the same time. Same as the film, itself.